Isn’t it incredible how a smell can transport you back to a place and time far easier than a photograph can? How the whiff of someone’s perfume, or browning garlic, or freshly cut grass causes often causes a flood of memories and emotions? 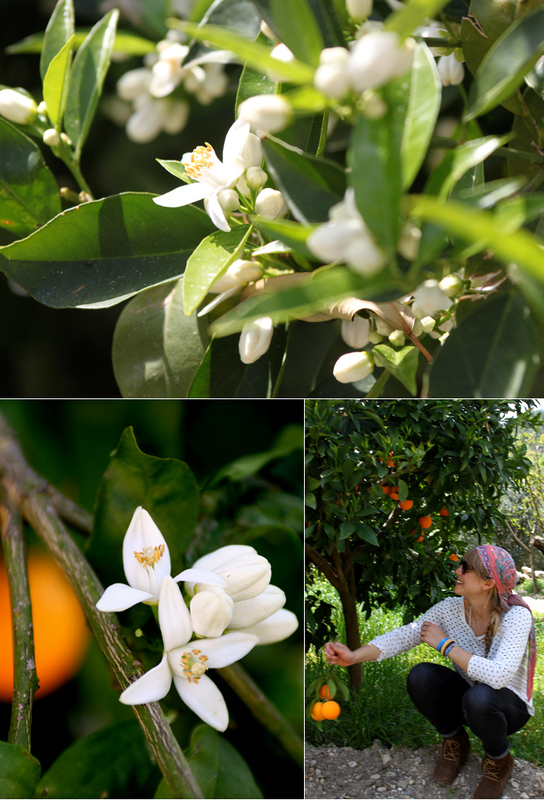 I know now that for the rest of my days, the intoxicating scent of orange blossoms will always take me back to the Mediterranean coast of Turkey. I believe I mentioned before how enchanting Turkey was, and surprising on so many levels. One thing that really struck me was the abundance of fresh produce from the obviously fertile landscape that surrounded the area we were traveling through. Banana plantations stretched from the turquoise sea up through the rolling hills of Antalya. The orange groves took over from there, topping blankets of chamomile draped across the fresh, spring earth. Herbs and grasses pulsed with fragrance under the persistent sun and the air was full of life. This cake was actually the recipe I started writing about even before returning home to Denmark. All amazing aubergines aside, Orange Blossom Sesame Cake is the one dessert that truly captured the essence of my experience in Turkey. The reason it appears before you now is because it took three rounds of experiments to get the thing right! I am not a baker whatsoever, but I’d like to think that I possess enough instinct to hit the nail on the head it most of the time. Ha. My pride and presumptuouness got the better of me this time. I eventually looked to the internet for guidance. Thank you, fellow food bloggers. My husband and I have a little joke going that if I ever left him, it would be for a jar of tahini. Sad, but (nearly) true. Luckily my marriage allows me to enjoy the best of both worlds – my main man and my tahini boyfriend on the side. I am sure I’ve canonized the stuff quite enough here on the blog, but since I’ve never delved into details about tahini, I think this opportunity is a perfect one. Tahini is simply a paste made from ground sesame seeds. There are several types out there however, ranging in colour, texture, flavour and of course processing techniques. The traditional Middle Eastern versions tend to be on the lighter and more liquid side of the scale, where I’ve noticed that “western” versions are darker, thicker and taste richer. The reason for this is usually because traditional tahini is made from hulled sesame seeds, meaning that the outer bran has been removed. Certain types of tahini then, cannot be considered a whole food because part of the original food is missing. When the bran is removed from the sesame seed much like when the bran is removed from a wholegrain, a great deal of the nutrition, and the cofactors needed for complete digestion, are lost. In the case of sesame seeds, we’re talking fiber, calcium, zinc, iron, and phosphorus taking a serious hit, and don’t we want those things? Indeed we do. Next time you’re at the shop, make sure to read the label of the tahini and purchase the type that is made from unhulled sesame seeds. Sometimes this sort of tahini will be sold under the name “sesame butter” indicating that is in fact different from regular tahini. But again, check the label to be certain – some sesame butters may also use hulled sesame seeds. Of course the same rule applies for buying sesame seeds. Always purchase the unhulled type to make sure you are getting a whole food and the most nutrition. Unhulled sesame seeds are darker and vary in colour more than their hulled counterparts, which tend to be a uniform creamy white. And since we’re on the subject, you might be asking yourself whether raw tahini is better than roasted. It may surprise you to discover that the roasted sesame version is easier to digest than the raw type. If you are purchasing raw sesame butter or tahini, check to see if the processing included soaking and dehydrating the seeds before grinding. This crucial soaking step unlocks the enzyme inhibitors, which would otherwise make it difficult for us to digest all the good stuff inside the seeds. And the dehydrating step is essential to preserving the sprouted goodness, otherwise the tahini wouldn’t even make it on to the store shelves before turning rancid. Raw sesame butter that is just ground sesame seeds can cost a lot more money, but fail to deliver the nutrition, and give you a really bad case of indigestion to boot! If you read back to my post about soaking nuts, you’ll get the full story. The creation process for all of my recipes starts with a spark of inspiration that can come from anywhere – a brightly coloured tomato on the vine, a story from a friend, a photograph in a magazine, or a day walking in the forest. What I always try to do however, is encapsulate some kind of experience and push it as far as it will go. The Orange Blossom Sesame Cake is a perfect example of that, as I tried to weave in as many elements from my Turkish travels as possible. The amazing thing is, all the elements come together beautifully almost as if a greater force was at work through the inspiration process, and all I have to do is trust. The highlights of my trip have now turned into the most recent highlight from my oven. The cake’s orange blossom water and oranges were inspired of course, by the miles and miles of citrus groves we passed (and one I actually got to indulge in); the sesame seeds that I bought from a little granny selling produce from her garden; the honey from the countless hives we saw; and the pistachios that I enjoyed in many pieces of baklava. 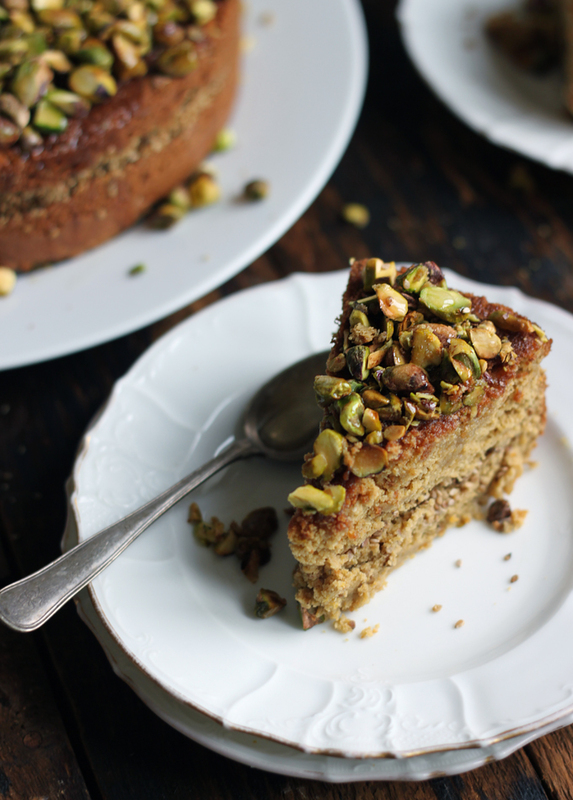 So really, this is an orange-blossom-sesame-tahini-honey-pistachio cake, but that title wouldn’t fit on the header. Because we’re using tahini in this cake, it doesn’t need any eggs, dairy or added oil. It is happily vegan and a great dessert to try out if you’re skeptical about baking without animal products because it is rich and moist and deeply nutty. The gorgeous “ribbon” of sesame seeds in the middle was a last minute thought, but made all the difference – a great alternative to icing that would certainly overwhelm the delicate flavours. You can find orange blossom water at many grocery stores, and most certainly specialty shops and Middle Eastern grocers. This ingredient is what makes this cake special from other desserts because of its pungent scent that imparts a floral kiss to the crumb. I should advise you to use only modest amounts of this potent liquid however, otherwise whatever you add it to can end up tasting like some kind of bizarre-o cleaning product. Its luscious scent will undoubtedly encourage you to pouring it onto and into all your favorite dishes, but I warn you, moderation is definitely the key. You’re after a whisper here, not a wail. 1. Begin by toasting the sesame seeds in a dry skillet over medium-high until they are fragrant. Remove from skillet to cool. Follow the same procedure with the pistachio nuts. Set aside. 2. Prepare a 9” (22cm) spring form baking pan with a little coconut oil. Preheat oven to 350°F (175°C). 3. Sift together the dry ingredients in a medium bowl. 4. Zest one of the oranges, and juice the rest (4-6 oranges). 5. Place the tahini in a large mixing bowl, add the zest and pour in the orange juice while whisking. Add the orange blossom water and sugar, and whisk until smooth (at least one minute). Add in the dry ingredients in thirds, and fold to incorporate. Then add the apple cider vinegar and stir quickly to incorporate (this reacts with the baking soda and puts air into the cake). 6. Pour half of the batter into the prepared pan, smooth out, then sprinkle with the sesame seeds completely covering the batter. Add the remaining batter on top. Place in the oven for 30-40 minutes until golden on top and a toothpick inserted into the middle comes out clean. Let cool for 10-15 minutes before removing from pan. 7. While the cake is baking, put all the syrup ingredients together in a small saucepan on the stove. Warm up on very low heat and stir often (do not let it boil). Once the syrup is well combined, remove from heat until ready to use. 8. Roughly chop pistachio nuts. 9. Once you have removed the cake from the pan, slice off the uneven top of the cake so that when you invert it, you’ll have an even bottom. 10. With the bottom of the cake now facing up, poke several holes in the top with a skewer. Cover the cake top with the pistachio nuts and pour the warm syrup over top. Slice and serve. I’ve just been featured on the fun website So How Was Your Day?. 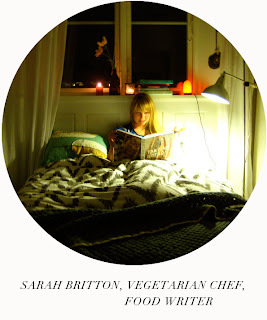 If you’d care to get a glimpse of a day in the life of Sarah B, check it out here. Hey! I have made this cake twice now, and both times, while the flavour is good, the batter is way to fluffy to “pour” in to a pan, or to “pour” on a second later. Also, it comes out a bit dry. I’m wondering what I might be doing wrong…? Considering increasing the liquid a bit or adding some oil. I have the same problem. And i just added more orange juice…also, the quantity of the batter is way too little for 20cm spring form…wondering what’s the problem too. I made this for a friends birthday and it was incredible! It was so nice and moist and the texture was amazing! The toasty sesame flavours and the orange blossom worked so well together! Would definitely recommend this! Thanks Sarah! My moms birthday is TOMORROW and I was looking for a recipe that suits her alleges, she can’t eat eggs, dairy or nuts. I thought this recipe was one of the best alternatives. In colombia we don’t have spelt flour, I do however have Tapioca and coconut flour, I am afraid of just substituting 1 -1 since Im not sure how will this change. Do you know what would be the appropriate amount of substitution????? I would really appreciate it if you could respond ASAP! Sarah, for some reason when I tried to bake it on a 9″ pan it seemed like i didn’t have enough batter to divide it in to two, I went over the recipe and everything I had put in and I couldn’t find the mistake, so I decided to put it into a 7″ and it worked out perfect. I thought well if I made a mistake the cake will be a bit weird, but it tasted awesome, any ideas what I may have missed? This looks divine, I definitely plan to make it. Has anyone tried this cake using almond flour instead of the spelt? I am afraid to be the first! This is the best cake I have ever made. Made it for my mother-in-laws birthday that I catered, and making at again next weekend for a 50th. I am making two: One person can not eat wheat or barley. Any ideas on flour substitutes that might keep a similar texture? effects. If the sun’s natural rays are that harmful, what did people of long ago use as sun protection. To learn all the details dealing with , check out the publisher’s website at. I made this cake last night and it was (and remains) totally lovely. It’s great to find vegan/whole food baking recipes that taste delicious without feeling like they’re sacrificing anything – this cake tastes like exactly what it is, it tastes complete. I learned about your incredibly amazing blog from LuxyHair sisters on Youtube sometime last year and I have been reading it ever since. Firstly, I would like to wish you a Happy New Year! May this year shower you with the best it has to offer! May you be healthy, joyous and may you realise all of your projects and endeavours! Thirdly, I wanted to share with you how divinely delicious this cake has come out! I diligently went out and bought all of the ingredients (minus the orange blossom water since I couldn’t find it but will definitely have it for the next time;) and decided to bake it for our New Year celebration dinner. My parents are observing a lent, so this vegan recipe was a lifesaver (; The aromatic smell was tantalising,the baking process was fun because I’ve learned new things about the ingredients and the final result is magnificent! It was my first attempt at baking something vegan and I must tell you that I have never tasted anything as decadent as this cake. Seriously!!!!! Thank you very much for this beautiful,filling, splendid recipe and for all the work you do in promoting healthy and healing eating and lifestyle! hey great cake, but when honey is heated doesn’t it turn acidic? Hi Sarah! Im in love with your blog, all your recipes are so amazing! I’d love to make this cake but do you know anywhere I would be able to find unhulled sesame tahini? I live near toronto (pickering) and I’ve looked at all the near grocery and health stores. I just discovered your blog and I am hooked! Sooo many great natural recipes! Thank you!! This cake looks incredible. I see why it is being linked to on other food blogs. Can’t wait for an occasion to make it. I do just love your blog! Hi Sarah ! Not surprisingly enough, I’m another food & health lover totally hooked to your blog & recipes. I was wondering whether you knew about some place in France where one can study holistic nutrition ? No, I don’t want to become YOU 😉 but reading your bio, I realised that what you studied was exactly what I wanted to learn ! I just didn’t know there existed places on Earth where such things are taught, apart from My New Roots – which is technically in Heaven, right ? Thanks for the explanation of hulled versus unhulled tahini. I always wondered what the differences were between the European type and the Japanese/asian type. The flavor is so different and the color is too. Putting this in the “must try dessert recipe” list! Hi Mo – I have no idea how many calories I eat in a day. I only try to eat as many veggies as possible! I’m loving the combination of flavors in this cake, especially the tahini and orange blossom water. Also, I had no idea about the different types and nutritional benefits of tahini, so I’m excited to put this new knowledge into practice. Great post! I truly admire your blog and think you are an inspiration to people everywhere. So please don’t get offended when I ask, how many calories do you eat per day? Hi! This looks amazing! Do you have a suggestion for what flour could be used in replacement of spelt, as spelt is not gluten free? Thanks!!! This sounds like a really interesting recipe, especially cause I really love the taste of tahini. Thanks for all the informations you’re giving us with your recipes! This cake looks delicious! I love pistachios and orange, so the combo sounds fabulous. One small note about the cake, however, is that technically it isn’t vegan as you state since there is honey in the syrup. Strict vegans don’t eat honey since it is an “animal” product, but I’m sure agave nectar could be substituted to make it completely vegan. Can’t wait to try the cake. Thanks for sharing the recipe. I’m a bit of a tahina addict, as well. It makes a great salad dressing mixed with yogurt and seasoned with garlic or chili. and it make a lick the dish clean desert if you mix it with date syrup. would i be able to make this gluten-free somehow? the cake looks absolutely beautiful, i’m definitely going to try it soon. super yum yum. can’t wait to try this. The minute I saw the picture I was impressed, but once I saw the ingredients I was sold. I must make this! This looks amazing and will try it soon. I had no idea about hulled vs. unhulled in tahini. Thanks for the education on it and I will now know what to look for when shopping for it again. Do you recommend a certain brand that you use? Appreciate it! I am new to your blog and LOVING it! Thanks! I had no idea about unhulled sesame seeds vs. hulled sesame seeds – you learn something new every day (like steel cut oats vs. rolled oats). This cake looks really delicious! Every single ingredient is in my top list of tastes! I think I’ll do it as soon as I invite friends otherwise I risk to eat too much of it! By the way, I made your raw cashew cake already 2 times. It’s just fantastic! I love it so much! 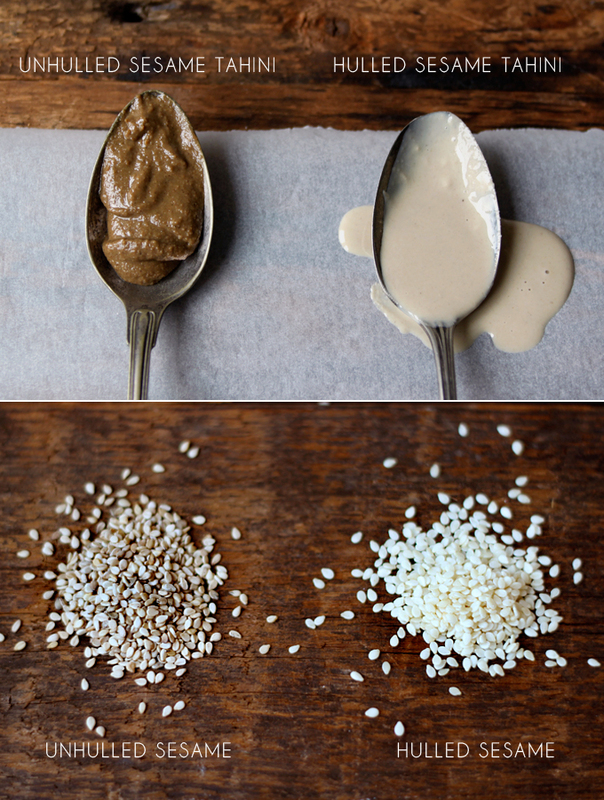 Crazy, I never knew all of this about tahini and sesame! I’ll be looking out next time I’m in the grocery store. 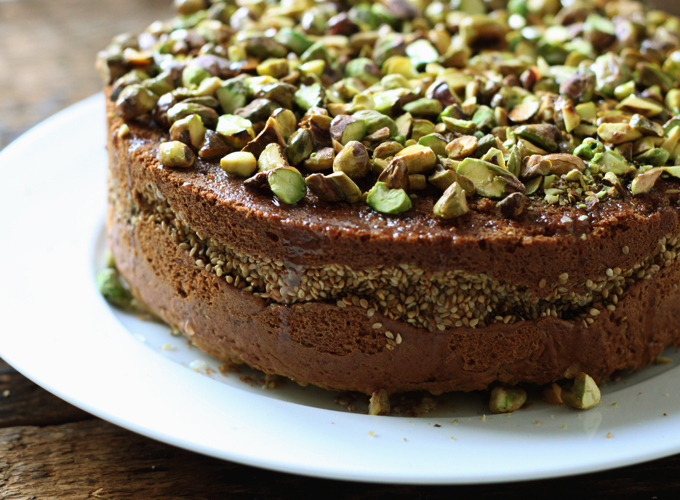 I have plans to make a fancy layered cake with pistachios for a birthday next week. Your recipe has come just in time! And congratulations on the new purchased apartment! I really enjoyed reading about your day and am looking forward to hearing more about this workshop in the Peruvian jungle. It sounds like a dream. Such a beautiful share, this post! You are so very radiant and it shines both through your words and obviously from the “sarah+oranges=love” pic. You have now left me with an enormous craving for your cake. It sounds absolutely divine! You can also have being a travel agent for Turkey as a side-kick because OMG you make me long going there. Looks wonderful, but I think you meant 1 tsp baking powder, not 1 tbsp? I love the idea of weaving the fragrance, tastes, and colours of your travels into a tangible souvenir – a recipe! Brilliant. Sarah. This. Looks. Amazing! I too love tahini and find my spoon in a jar sometimes 🙂 I cannot wait to try this cake because I know I’m going to love it.